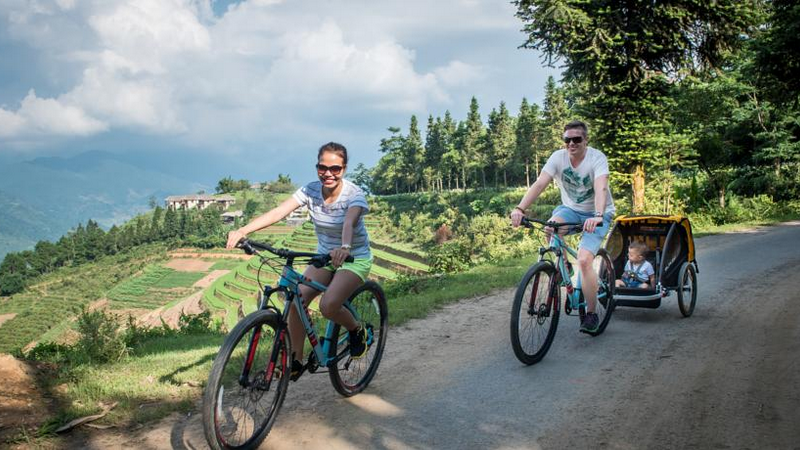 You will start from Topas Ecolodge by cycling on a quiet road for a while before taking a descent to Ban Ho village. At the bottom of the valley you will meet the Tay minority, the largest ethnic minority group living in Sapa, who are famous for their beautiful and traditional stilt houses. You will be warmly welcomed to visit their home, experience their daily life of farming and fishing in the river. Leaving Ban Ho village your ride becomes a bit more challenging with ascending parts on the winding road. At Thanh Phu village, also inhabited by Tay minority, your lunch is served at a nice local family where you enjoy the valley view while tasting the local foods. In the afternoon, you will pass by My Son village of Xa Pho ethnic minority, who belongs to one of the smallest ethnic groups in Vietnam. You now continue the ride deeper into the mountain area to Nam Cang village, inhabited by Red Dao minority. Nam Cang village locates at the most remote area of Sapa. The Red Dao women wear some of the most colorful and diverse costumes of all Vietnam’s ethnic groups. Herbal bath, local medicine and embroidery are some of the things that the Red Dao are very skilled at. If time permits, you can take a swim in the river next to Nam Cang Riverside Lodge, before meeting your vehicle for the journey back to Topas Ecolodge.